We are very excited to have just received a new pillow top range from Hypnos! There are 3 new mattresses: the Celestial, Astral and the Aurora. They all contain natural materials and use the revolutionary 37.5 degree technology. If the beautiful build quality, luxurious comfort and 10 year guarantee are not enough then we are also offering the whole pillow top Hypnos range with 25% off! 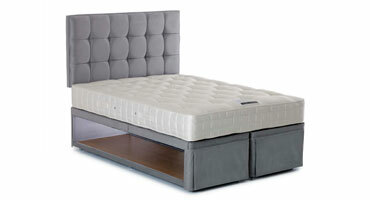 Come in today and try these new mattresses or the full range from our showroom today. This luxury no turn mattress features a ReActive™ pocket spring system, where each ReActive™ spring has 8 active turns – independently and actively sensing your shape and weight distribution, providing comfort and total spinal and body support.